I’ve been a Largo Realtor since 2010 and am proud to be with the Coastal Properties Group International brokerage. I am a long time resident of Largo Florida since 2003 and love all the things to do in Largo and nearby. My real estate focus is on the Largo and Seminole areas but I have helped buyers and sellers throughout Pinellas County. One of the things I am most proud of is that I have been immersed in the community for years and bring an extensive hyper-local knowledge of the area. I am a huge advocate of community and civic involvement. I am a past President of the Rotary Club of Largo and am currently the public relations chair for the club. I am also chairwoman of the City of Largo's Community Development Advisory Board and serve on the Career Education Advisory Board with the Pinellas Education Foundation. I also serve as VP of the School Advisory Committee with Largo High School. In the past, I was also involved in the Largo Citizen's Academy, Leadership St. Pete, St. Pete's Council of Neighborhood Associations Leadership Program, and the St. Petersburg Citizen Police Academy, as well as a former board member for Largo's Recreation, Parks & Arts and the Jr. League of St. Petersburg. I was born and raised in Maryland, and graduated from Salisbury University with a BA in both Political Science and Philosophy, then enlisted in the U.S. Army. I met my husband during advanced training at Ft. Sam Houston in Texas, then moved to Tampa Bay in 1998. We've lived in both St. Petersburg and Largo. 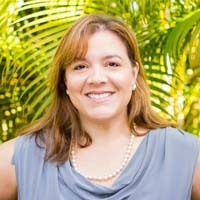 I have been a full-time Largo REALTOR since 2010, helping hundreds of families buy and sell properties on the Gulf coast of Florida. From the initial consultation to the closing table, I like to save time for my buyers and sellers and reduce stress by providing research, negotiation skills, and market knowledge. Choosing to work with me as your real estate agent means excellent customer service, and a high competence in technology, social media, online and traditional marketing. I am a member of the Institute of Luxury Home Marketing (ILHMM), the Pinellas Realtor® Organization, Florida Realtors® and the National Association of REALTORS®, and am a Certified and Pricing Strategy Advisor (PSA). On a personal level, I have 2 wonderful daughters who keep me busy with their school events, dance and tennis schedules. My husband is a Captain with St. Pete Fire Rescue. I am dedicated to service above self in this industry, counseling clients with enthusiasm, determination, and a results-driven “out of the box” attitude when it comes to buying and selling real estate in Tampa Bay. I look forward to assisting you with your real estate needs!